The authors behind the new book are here to help you build a fully operational battle station, a winning podracer and a perfectly balanced BB Unit. 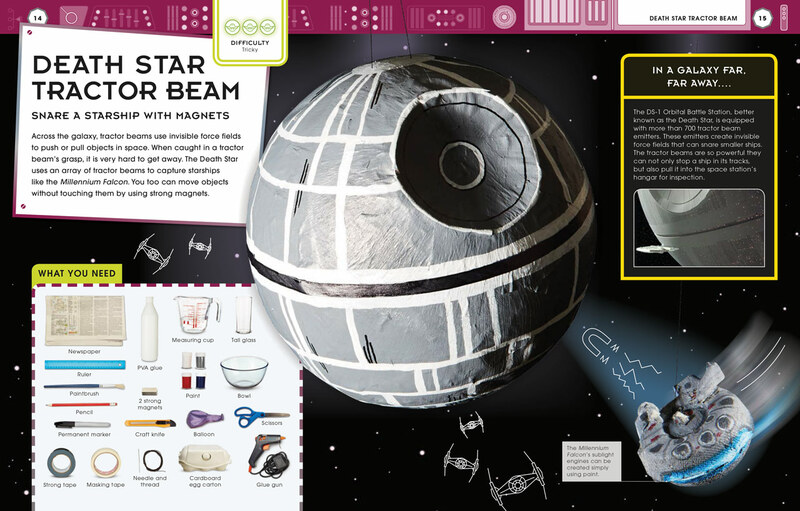 When science and Star Wars collide, lightsaber duels and the Force itself come to life with fun do-it-yourself experiments that help explain real-world science and Star Wars fantasy. In honor of the release of Star Wars Maker Lab, a new book of 20 projects that hit shelves this week, we asked authors Liz Lee Heinecke and Cole Horton to offer some helpful tips for makers of all ages focused on three of our favorite projects! Liz Lee Heinecke: Put on your engineer’s hat. This project will take some fiddling around as you assemble your BB Unit and attach different components. Cole Horton: This project is a lot like working on a real droid in the Star Wars universe. Between routine maintenance, combat damage, and extreme environments, droids need someone like you to keep them in good condition. Liz Lee Heinecke: Embrace the physics of a perfectly spherical hamster ball. 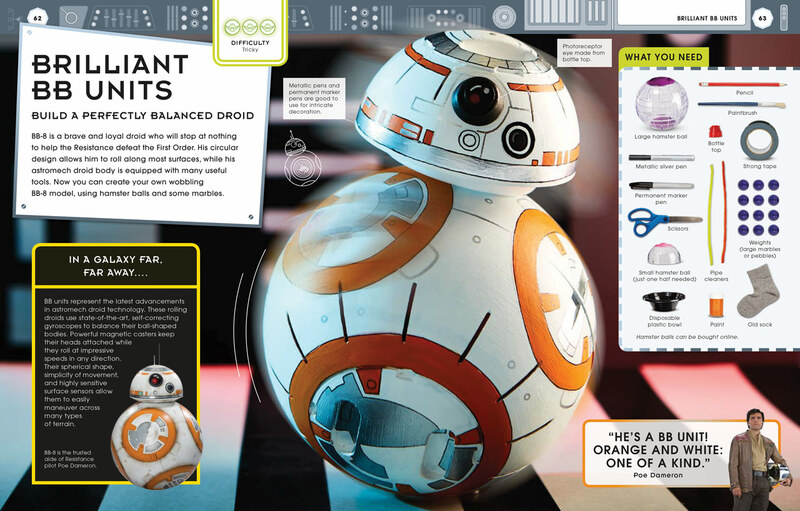 The real BB-8 is a masterful feat of invention. 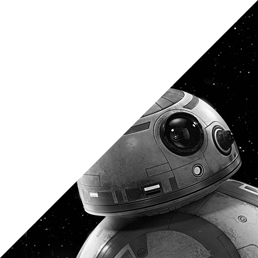 Before fans learned how the rolling mechanism worked, there were rumors that BB-8 was hamster-powered. 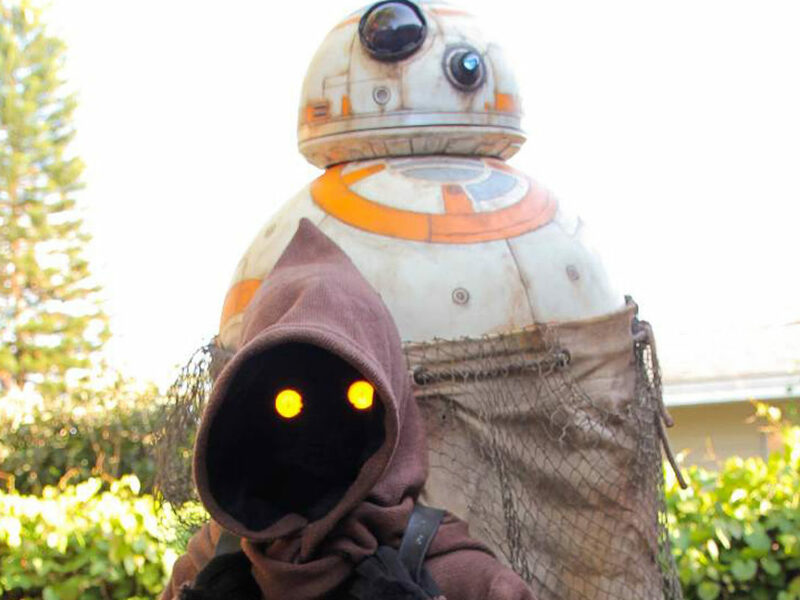 Cole Horton: Turns out, BB-8 is brought to life by a crew of talented puppeteers and robot builders. Their fleet of BB-units is ever expanding too. There are many Resistance and First Order droids you can recreate once you have finished building BB-8. Liz Lee Heinecke: Make sure that the marbles or pebbles are secured tightly together in one end of the sock before you tape it in to the ball. Otherwise, gravity will cause them all to shift around when you rock the ball, and your BB-8 unit won’t wobble as well. 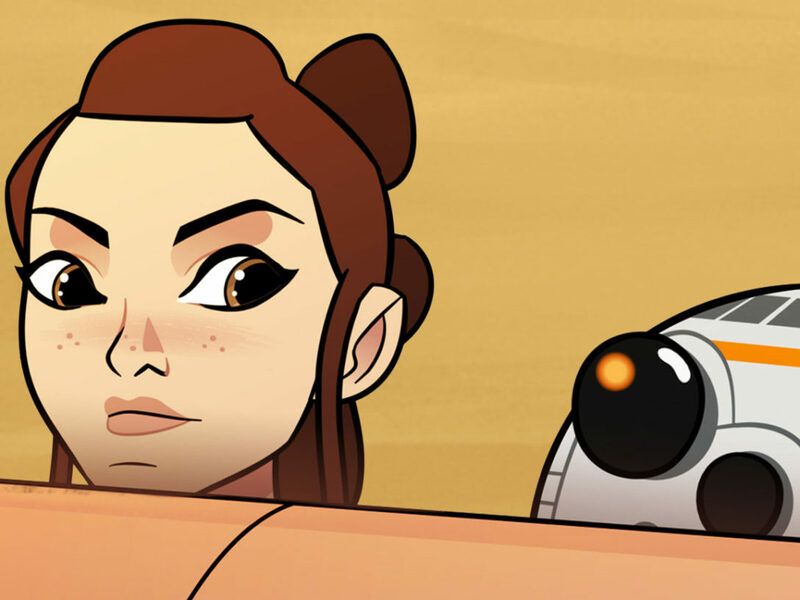 Cole Horton: You don’t want your BB-8 to be filled with loose items. As BB-8 learned on Canto Bight, extra bits rattling around—like casino chips—aren’t good for a droid! Liz Lee Heinecke: Don’t forget to add the photoreceptor eye detail. Cole Horton: While humans depend on lenses and cells in our eyes to send signals to our brains, BB-8 units depend on a photoreceptor to transmit information about their environment to their droid brains. Liz Lee Heinecke: Test your own center of gravity by standing up straight over a soft surface like grass and having someone try to push you off balance. Now crouch down and try it again. You’ll find that you are much harder to tip over when your center of gravity is low. Cole Horton: Like a Jedi preparing for combat, you must focus, hold steady, and find balance. Liz Lee Heinecke: As you assemble the podracer, make sure that everything is in balance. If one side is heavier than the other, it will affect performance. Cole Horton: You’ll have to manage without a pit droid, the small mechanic droids that podracer pilots use to maintain and repair their pods. That’s OK though; pit droids are often more trouble than they are worth. Liz Lee Heinecke: You need a good base. Before you glue, check that the ice-pop sticks are parallel. This will help keep the podracer aligned when you start adding other parts. Cole Horton: You don’t want to have a Ben Quadinaros situation where your engines fly off in different directions. Liz Lee Heinecke: Avoid friction or rubbing between your podracer’s wheels and other objects on the racer, since frictional force will slow it down. Double-check that the cardboard engine support doesn’t touch the wheels. Cole Horton: Crashes are frequent in podraces, but you should try to avoid obstacles with your pod. After all, you can’t win a race you don’t finish. Liz Lee Heinecke: Try different rubber or elastic bands to see which one works best. Rubber bands come in all sizes, and the length and width of the band will affect how much potential energy it can store when you wind it. Cole Horton: Sebulba’s X-shaped podracer engines were known as some of the most powerful in the podracing circuit. Their high potential energy, combined with Sebulba’s cheating, are a tough combination to beat. 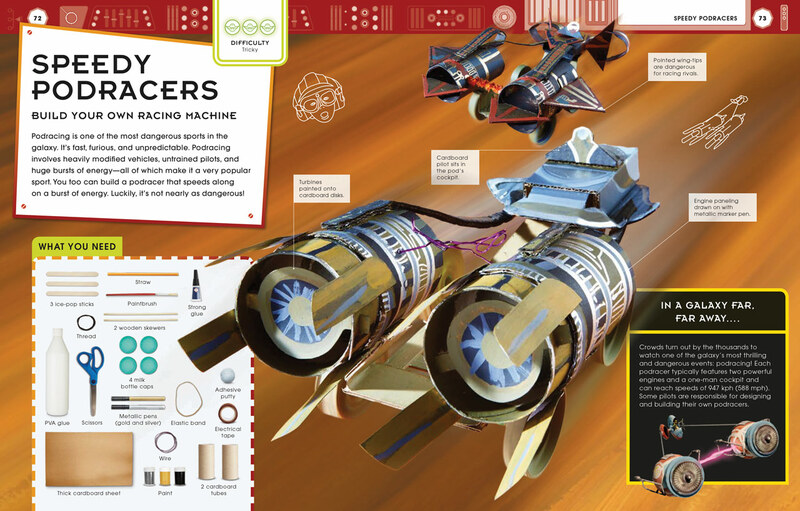 Liz Lee Heinecke: Don’t be afraid to re-design your podracer. Everything from the amount of weight on the back of your racer to the size of its wheels can affect how fast and far it will go. 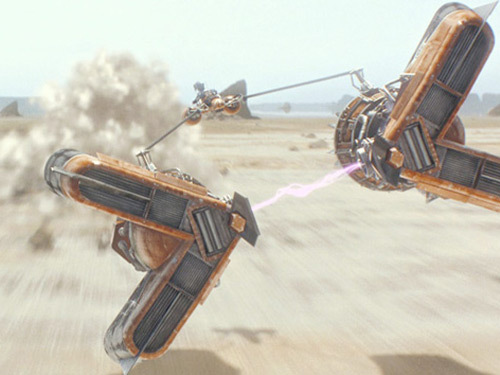 Cole Horton: In fact, every podracer in Star Wars is different from the rest. Some of our favorites include Ebe Endocott’s blue and orange pods, Teemto Pagalies’s uniquely round cockpit, and Neva Kee’s Y-shaped pod with a forward cockpit. Liz Lee Heinecke: Use plenty of glue and water mix on the newspaper strips to create a smooth surface for your Death Star. The PVA or polyvinyl acetate in glue is a chemical called a polymer, which is a long chain of molecules. 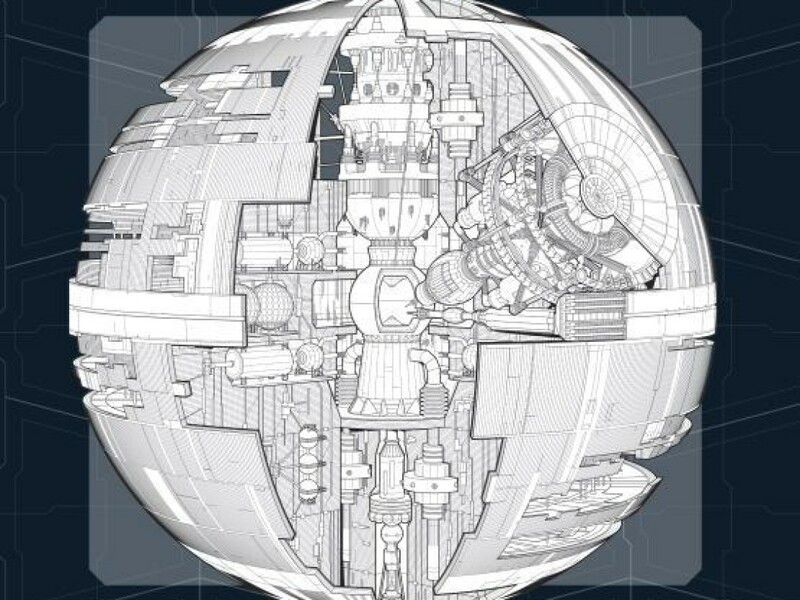 Cole Horton: The Death Star is so large that it looks rather smooth from a distance, but flying up close reveals that its surface is dotted with structures, laser towers, and other details. Liz Lee Heinecke: Remember, the more newspaper layers you add to the balloon, the sturdier and more resistant to outside forces your Death Star will be. Cole Horton: The Death Star’s nearly indestructible surface was built from materials harvested from the asteroids circling the planet Geonosis. But don’t worry, you don’t need to mine anything to build this space station. Liz Lee Heinecke: To avoid collapsing the Death Star, make sure that the paper is completely dry before you cut a hole around the spot where the balloon is tied. Cole Horton: Much like Galen Erso, who sabotaged the Empire’s super weapon, you might create a weak spot in your Death Star if you cut too soon. Liz Lee Heinecke: Be sure to use plenty of tape or glue when attaching magnets to the Death Star and the Millennium Falcon. Test them to make sure they’re oriented so that the north pole of one magnet comes near the south pole of the other so they’ll attract when the Falcon comes near the Death Star. If they fall out of place, you’ll have to take things apart to re-secure them. Cole Horton: Don’t worry if you don’t get it right the first time. Han Solo and Chewbacca spent a lot of time making special modifications and repairing the Millennium Falcon. Being a starship captain isn’t always the most glamorous job. 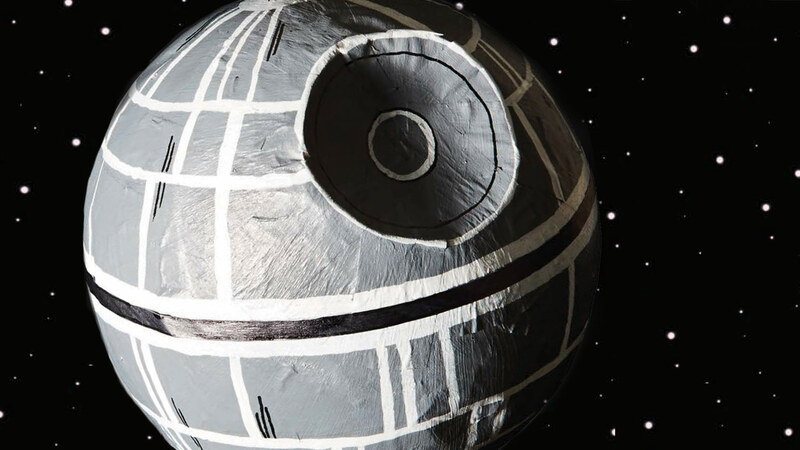 Liz Lee Heinecke: Using masking tape will help you draw straight lines around the Death Star. Cole Horton: These lines represent the trenches in the Death Star’s surface, just like the one that Luke Skywalker flew on his bombing run to blow up the space station. Ready to try your hand at these and other fun projects? Star Wars Maker Lab is available now!